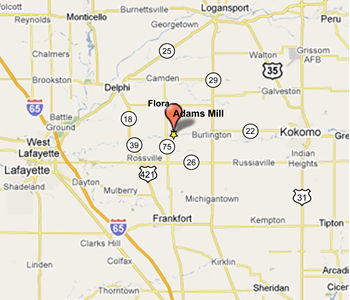 Take SR 26 east past Rossville to SR 75, then north to 500 S, then east to E 75 S following the Adams Mill signs. Take SR 75 north past SR 26 to 500 S, then east to E 75 S following the Adams Mill signs. 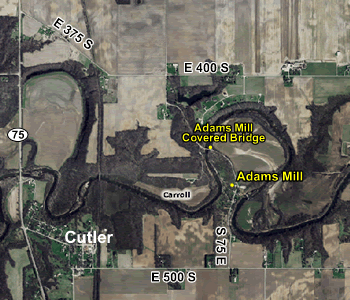 Take SR 29 south to CR 500 S, then west to E 75 S following the Adams Mill signs. Take US Hwy 31 S to SR 26, then west to SR 75, then north to 500 S, then east to E 75 S following the Adams Mill signs.